I neglected to take process photos of this piece as I worked on it, so I can’t really give you an exact bead count and a step-by-step. However, I can still give you plenty of pointers! 1. Chose a mixture of metals and bead colors that all look good together. 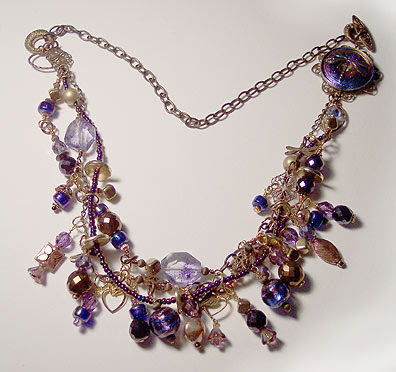 I used copper, bronze, antiqued brass, which all look really good with the blue to purple tones of the beads. There are also some bronzed glass beads to emphasize the metallic tones. 2. Create three strands, each different, and anchor them to toggle loops. I used large hammered loops and a filigreed piece as intermediaries between the strands and the toggle loops. 3. Attach a substantial chain to one loop, and attach a toggle clasp to the other end of the chain. The toggles will be design elements, not hidden in the back. Don’t use a thin chain or it will dig unpleasantly into your neck in the back. 4. Create many many many wrapped loops around small clusters of beads and charms. Scatter these along the three strands and attach each with a jump ring. 5. Twist the strands slightly if you like a wilder look before fastening the necklace shut.